On one hand we would like to congratulate any company that provides their Crisps in a tub - just like the good old days. However, a black tub and a colour coded arc at the top, with an image of a couple of Crisps on the front and a random black and white photo on the back, is not much of a design. Even just making the plastic lid the flavour colour coding would make a massive difference! As for the bag design, well again there is flavour colour coding, but the writing is old fashioned and doesn't do anything to build a brand. And the central image just looks out of place. 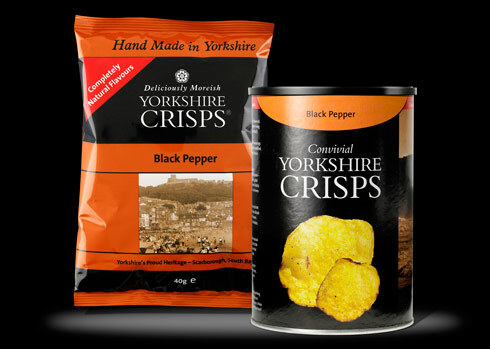 These Crisps had an almost home-made crunch about them. A few were somewhat soft to the munch, but most had a crisp and crackling crunch that was sustained throughout the majority of the eating process; the mush stage appearing quite late on. These Crisps looked crispy and crunchy at first sight, which has to be a good thing. They were irregularly shaped Crisps and there was a wide range of sizes. The general colour was very pale, with darker shades of brown emerging throughout the general colouring. There were also a few black seasoning spots dotted around. A Nose Plunge Test did not give much away. Unfortunately, neither did the taste. There was a potatoey backdrop and there was a little saltiness to them, but the Pepper was a little muted. There should have been more.